Hatch FP100 Centurion Forearm Protection (Black, One Size) by Hatch at Joes V Cycle. SKU: FP100. MPN: HGFP100. Hurry! Limited time offer. Offer valid only while supplies last. Black one size fits all. Forearm protectors have been designed for use with the CPX1000 to shield the entire forearm from the wrist to the elbow. Black one size fits all. 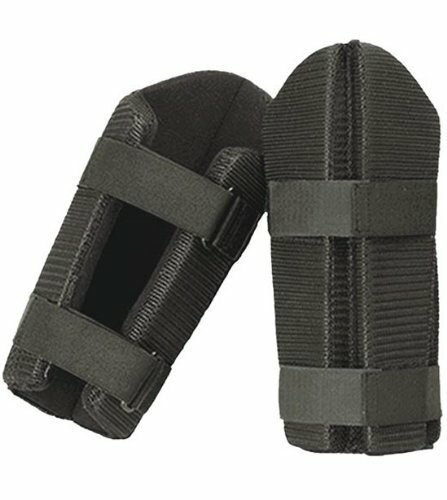 Forearm protectors have been designed for use with the CPX1000 to shield the entire forearm from the wrist to the elbow. Construction consists of durable EVA foam covered by a hard-shell plastic without hindering mobility during tactical or riot situations. The FP100 does not provide ballistic protection, but will safely blows delivered from blunt objects. Adjustable Velcro straps. Weighs approximately 6 ounces.